Rafael Santi – is one of the most famous painters of Rome, who became famous throughout the world for painting the Vatican villages. The artist’s eclectic approach to work, as well as his critical mindset attracted citizens, and, therefore, he never sat without work. 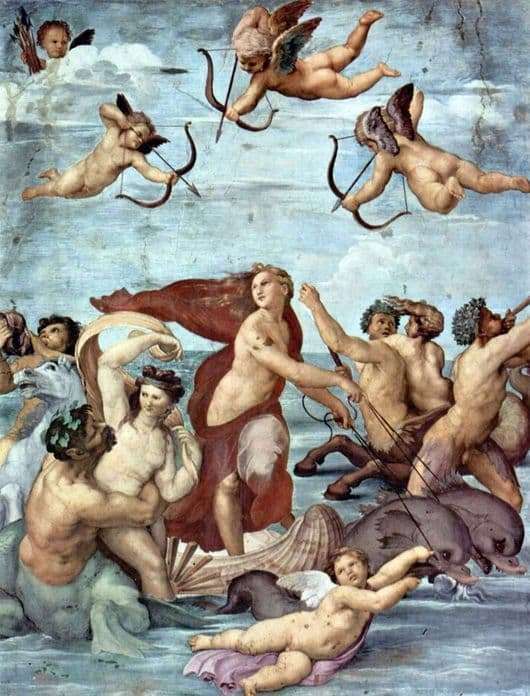 Not remained indifferent to the work of Raphael and a passionate admirer of painting, a certain Agostino Chigi, who ordered one of the most significant works – “Triumph of Galatea”. Agostino Chigi in 1510 started the construction of the magnificent palace of Villa Farnesina, which draws out with magnificent luxury. Being familiar with the works of Raphael, Chigi asks the painter to paint the walls inside one hall. There is an opinion that the artist borrowed inspiration for the picture in the poem “The Triumph of Galatea” by the Greek poet and philosopher Theocritus. It is known that Raphael was an ardent fan of the ancient era. Some of the details of the picture clearly have similarities with the work of Sandro Botticelli “The Birth of Venus”. As for the technique of modeling work, she was borrowed from Michelangelo. True, supplemented by his own touches of Raphael, who did not notice the auto technology. The plot of the picture is both simple and clear: Polyphemus, having lost his mind from jealousy and love for Galatea, who does not share his feelings, kills her lover, burying his body under the rocks. A distraught girl with grief turned the blood of her beloved into a fast and transparent river. And ever since Galatea is considered the patroness of rivers, seas, oceans and all those who are somehow connected with water. The Galatea painting depicts a chariot in the form of a shell drawn by dolphins. That is how Raphael saw the sea goddess. To complement the composition, the girl was surrounded by mythical creatures, which set the mood for general triumph and happiness. Naked bodies are ideally underlined by golden tones, gently blue sky and blue sea.